Quick and easy and super elegant!! I never really make cards, not my thing, I go to the stores and buy mine! But when it comes to valentines day I do love to put more effort and love into my gift. This year is especially special as we will be spending our day in Vanuatu and because we will be traveling, I thought I should get in super early and get the card and box made so it is ready to go! The set is really super easy to make! Even more so if you happen to have some Spellbinders and a personal die cut machine on hand. Cut your card to your size of choice. Use a large corner rounder the round off the top right corners. Cut two contrasting pattern papers down to a smaller size and round off their left corners. Cut your title block and round off both of the top corners. Use a distressing tool to roughen up the edges. Adhere all your layers of paper and rub on your title to the title block. 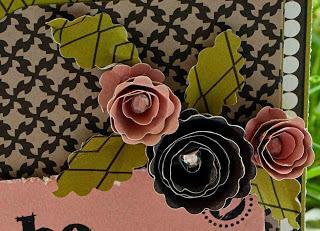 Using your Spellbinders Flower die and a die cut machine of your choice, cut out 4 flower spirals. Roll up the spirals and adhere with glue. For the larger black flower, I simply created a looser roll. Use your Spellbinders to cut out 4 leaves. Embellish your card and flowers with some bling. Finish off the inside of your card. Either use your vinyl cutter or simply hand cut the heart box from this template. Add some pattern paper on the front and sides to make it pretty. I used my vinyl cutter to cut out a scallop edge heart to adhere to the front. Rub on your valentines saying to a block of cardstock. Cut to size. Adhere all your layers of patterned paper and your title block to the front of your box. 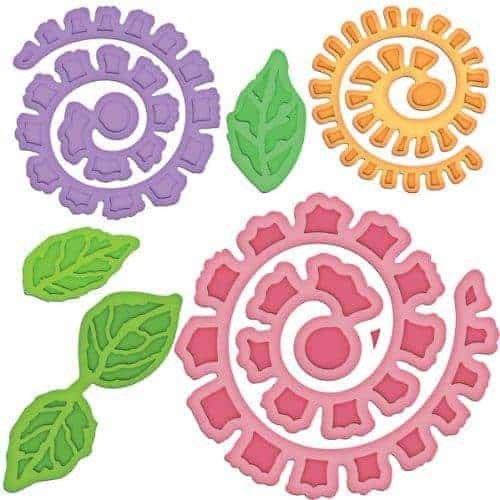 Using your Spellbinders Spiral Blossom One Stencils, cut out 3 flowers and 3 leaves. Adhere your flowers and leaves to your box and embellish with some bling. 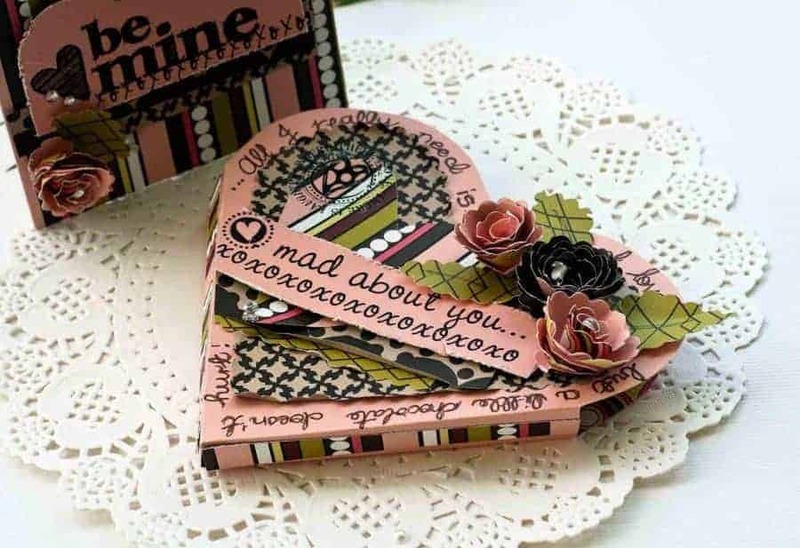 I also added a bit of a message around the heart shape patterned paper on the front. This is an open heart box, and just absolutely perfect to pop in a gift voucher, some chocolates or something more special like jewelry etc. What more do you really need? Okay guess a bottle of champers, some candles and a gorgeous yummo dinner and some quiet time together would be good too!!! 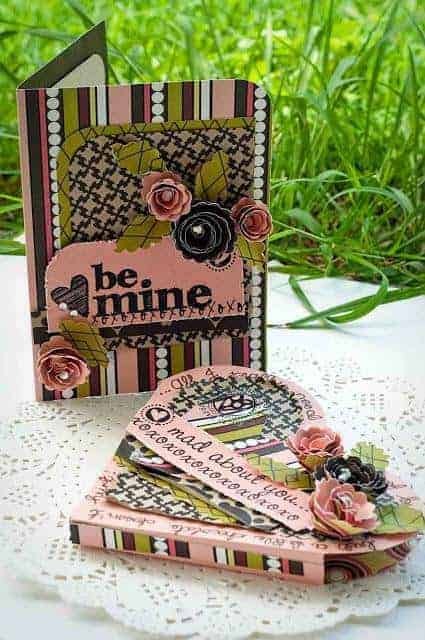 When you get around to making Valentine’s day crafts, please share your link below so I can check it out!